Dry-heat cooking refers to any cooking technique where the heat is transfered to the food item without using any moisture. Dry-heat cooking typically involves high temperatures, meaning 300°F or hotter. Note that the browning of food, as when bread is toasted, can only be achieved through dry-heat cooking. This browning in turn leads to the development of complex flavors and aromas that can't be attained through moist-heat cooking techniques. Sautéing requires a very hot pan. When sautéing, it's important to heat the pan for a minute, then add a small amount of fat and let the fat get hot as well, before adding the food to the pan. Another key is not overloading or crowding the pan. The pan must stay hot in order to achieve the desired browning of the food. 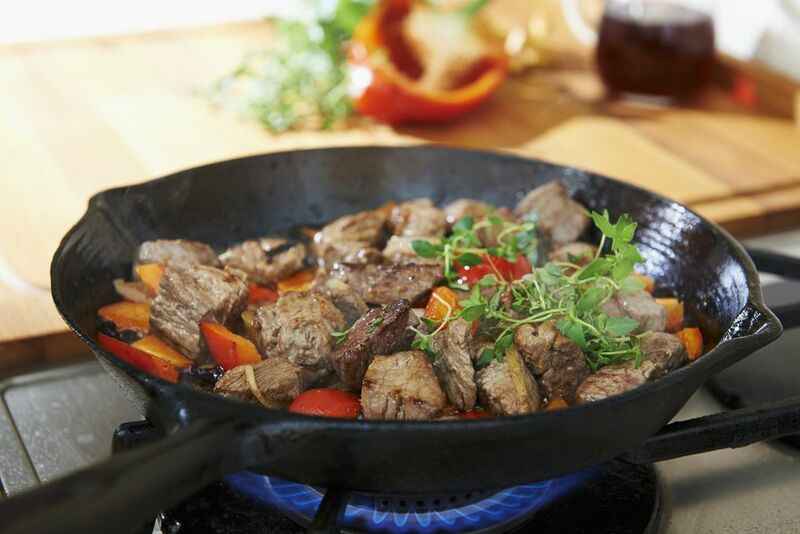 Too much food in the pan dissipates the heat, causing the food to steam or boil rather than sauté. One method for maintaining a hot pan and ensuring the food cooks evenly is through tossing or flipping the food in the pan — sauté actually means "jump" in French. Some sauté pans have sloped sides to facilitate this, but it's generally only done with smaller pieces of food, especially vegetables. For a demonstration, here's a video on how to sauté vegetables. The words roasting and baking are largely synonymous in that they both describe a method of cooking an item by enveloping it in hot, dry air, generally inside an oven and at temperatures of at least 300°F (but often much hotter). This technique cooks food fairly evenly since all of the food's surfaces are exposed to much the same degree. This differs from pan-searing, for instance, where the surface that touches the hot pan gets much hotter than the side that faces up. Roasting and baking both require that the food be cooked uncovered, so that it's the hot, dry air that delivers the heat, not steam from the food. Despite these similarities, roasting and baking can mean slightly different things depending on who you ask. Some chefs use the word "baking" only when speaking of bread, pastry and other bakery items. Some may use the word "roasting" only when referring to meats, poultry and vegetables, but use the term "baking" for fish and other seafood. Yet another distinction can be made with respect to temperature, with "roasting" implying greater heat and thus faster and more pronounced browning. Broiling is another dry-heat cooking method that relies on heat being conducted through the air. Because air is a relatively poor conductor of heat, broiling and grilling require the food to be quite close to the heat source, which in this case is likely to be an open flame. Thus the surface of the food cooks very quickly, making this type of cooking ideal for poultry, fish and the tenderest cuts of meat. In fact, because of the extremely hot and dry nature of this cooking method, it is customary to marinate meats that will be broiled or grilled. Since deep-frying involves submerging the food in hot, liquid fat, it might take some time to get used to the idea that it's actually a form of dry-heat cooking. But if you've ever seen the violent reaction of hot oil to even a tiny drop of water, you know that oil and water are a couple of opposites that want nothing to do with each other. To avoid that, make sure anything you place into the hot fat is free from excess moisture. That might mean patting an item dry with a paper towel before frying it. Deep-frying requires keeping the oil at temperatures between 325°F and 400°F. Hotter than that and the oil may start to smoke, and if it's any cooler, it starts to seep into the food and make it greasy. After cooking, deep-fried items should actually have very little oil on them, assuming they've been fried properly.